Die Veneris, 16 Nov. 18 Car. IIdi. 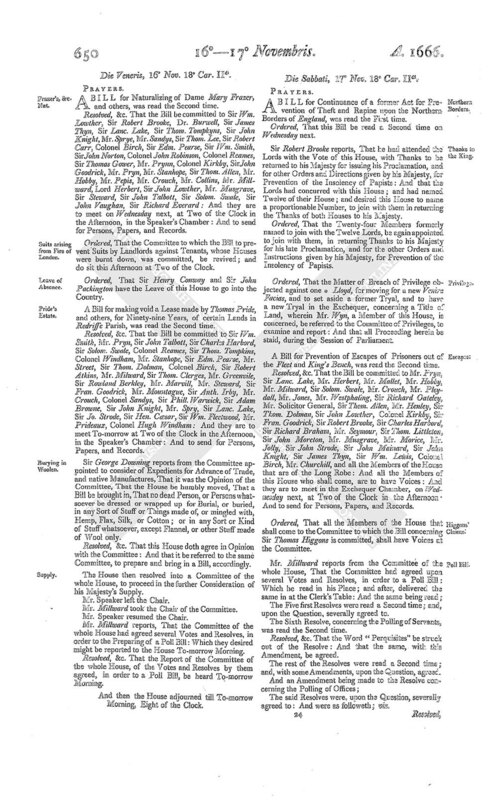 A BILL for Naturalizing of Dame Mary Frazer, and others, was read the Second time. Resolved, &c. That the Bill be committed to Sir Wm. Lowther, Sir Robert Brooke, Dr. Burwell, Sir James Thyn, Sir Lanc. Lake, Sir Thom. Tompkyns, Sir John Knight, Mr. Sprye, Mr. Sandys, Sir Thom. Lee, Sir Robert Carr, Colonel Birch, Sir Edm. Pearse, Sir Wm. Smith, Sir John Norton, Colonel John Robinson, Colonel Reames, Sir Thomas Gower, Mr. Prynn, Colonel Kirkby, Sir John Goodrick, Mr. Pryn, Mr. Stanhope, Sir Thom. Allen, Mr. Hobby, Mr. Pepis, Mr. Crouch, Mr. Collins, Mr. Millward, Lord Herbert, Sir John Lowther, Mr. Musgrave, Sir Steward, Sir John Talbott, Sir Solom. Swale, Sir John Vaughan, Sir Richard Everard: And they are to meet on Wednesday next, at Two of the Clock in the Afternoon, in the Speaker's Chamber: And to send for Persons, Papers, and Records. Ordered, That the Committee to which the Bill to prevent Suits by Landlords against Tenants, whose Houses were burnt down, was committed, be revived; and do sit this Afternoon at Two of the Clock. Ordered, That Sir Henry Conway and Sir John Packington have the Leave of this House to go into the Country. A Bill for making void a Lease made by Thomas Pride, and others, for Ninety-nine Years, of certain Lands in Redriffe Parish, was read the Second time. Resolved, &c. That the Bill be committed to Sir Wm. Smith, Mr. Pryn, Sir John Talbott, Sir Charles Harbord, Sir Solom. Swale, Colonel Reames, Sir Thom. Tompkins, Colonel Windham, Mr. Stanhope, Sir Edm. Pearse, Mr. Street, Sir Thom. Dolman, Colonel Birch, Sir Robert Atkins, Mr. Milward, Sir Thom. Clerges, Mr. Greenvile, Sir Rowland Berkley, Mr. Marvill, Mr. Steward, Sir Fran. Goodrick, Mr. Mountague, Sir Anth. Irby, Mr. Crouch, Colonel Sandys, Sir Phill. Warwick, Sir Adam Browne, Sir John Knight, Mr. Spry, Sir Lanc. Lake, Sir Jo. Strode, Sir Hen. Cæsar, Sir Wm. Fleetwood, Mr. Prideaux, Colonel Hugh Windham: And they are to meet To-morrow at Two of the Clock in the Afternoon, in the Speaker's Chamber: And to send for Persons, Papers, and Records. Sir George Downing reports from the Committee appointed to consider of Expedients for Advance of Trade, and native Manufactures, That it was the Opinion of the Committee, That the House be humbly moved, That a Bill be brought in, That no dead Person, or Persons whatsoever be dressed or wrapped up for Burial, or buried, in any Sort of Stuff or Things made of, or mingled with, Hemp, Flax, Silk, or Cotton; or in any Sort or Kind of Stuff whatsoever, except Flannel, or other Stuff made of Wool only. Resolved, &c. That this House doth agree in Opinion with the Committee: And that it be referred to the same Committee, to prepare and bring in a Bill, accordingly. The House then resolved into a Committee of the whole House, to proceed in the further Consideration of his Majesty's Supply. Mr. Millward reports, That the Committee of the whole House had agreed several Votes and Resolves, in order to the Preparing of a Poll Bill: Which they desired might be reported to the House To-morrow Morning. Resolved, &c. That the Report of the Committee of the whole House, of the Votes and Resolves by them agreed, in order to a Poll Bill, be heard To-morrow Morning.